As an act of protest and commemoration, we will mark the 60-year anniversary of the Trinity test, somewhere in the desert. This simulation is much more than a big flame effect. It is a somber memorial, a wake for the 60 years since the Trinity detonation. The world was forever changed in that moment, and we feel the gravity of this as we prepare for our event. There are an estimated 30,000 nuclear warheads in the world today, yet many people have completely forgotten about this threat to the world. Most are barely aware or complacent about the fact that our government has reembarked on modeled testing of small "tactical" nuclear weapons such as the "bunker buster". There are nearly endless destructive effects of a nuclear detonation we would not dream of recreating, nor force on an unwilling audience. Blinding light and killer shockwave, horribly burning and maiming innocent people. Fallout carrying for miles. Radiation sickness, and cancer for generations. But to capture the gravity of these effects through art, we are coordinating a series of performances before and after our detonation to bring to the surface the deep emotional impact and human toll of nuclear weapons. The centerpiece to the Simnuke Project, we will create an immense column of fire, roiling up to the sky in a searing mushroom cloud. Using the most environmentally and safety conscious means, we will burn fuel (not an explosion) shaped in a way to give the look and feel of a nuclear event. In witnessing this simulation, the viewer (in person and in video documentation) will be able to map their historical and cultural experience to a visceral, body experience. The flash of light, the heat, the sound pressure wave will wake the audience from its long dream of distance from nuclear destruction. Simnuke is created with what is possibly the world's largest flame-effect machine, comprised of six large fans with spray nozzle assemblies in front of the fans. The fans are arranged in a circle, with each fan pointed towards the center of the circle. 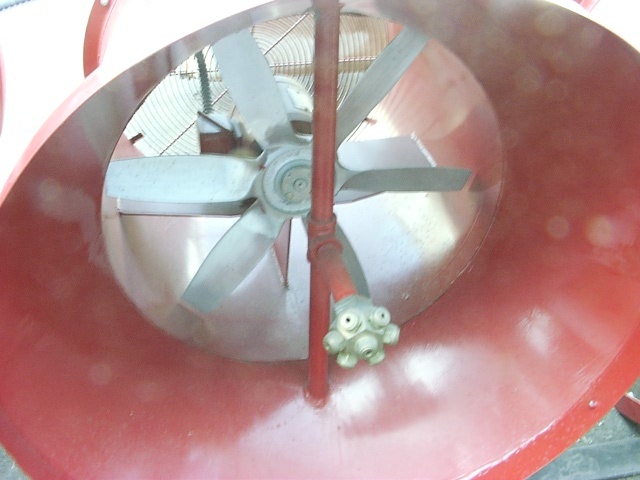 Using a series of pumps, fuel is driven through the valves to the nozzles to create droplets, and each fan creates an airflow that mixes with the fuel. As this mixture passes over the pilot light, the fuel is ignited and burns, but does not explode. 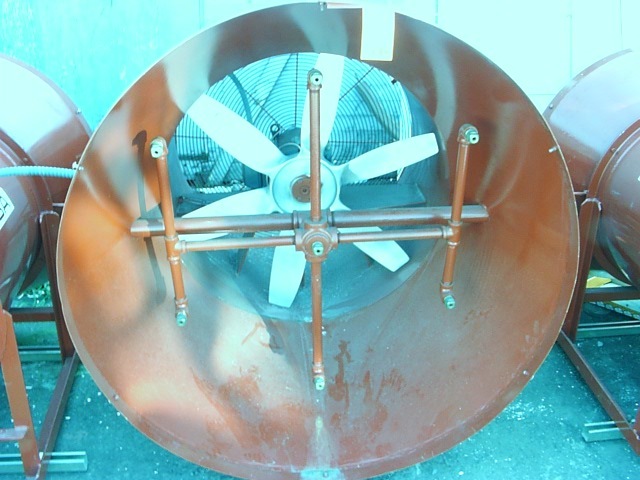 Each of the six fans creates a plume of flame about eight feet wide. View some images of the system in testing. We will place the fans in such a way that each plume merges. These join to form one extremely hot and large mushroom fireball that will rise toward the sky for hundreds of feet. As the fire dissipates, the audience will feel the impact of those events 60 years ago. They will reflect on the pain and suffering caused through the Atomic age - to the people of Japan, to US atomic veterans, to citizens downwind of the Nevada Test Site, to the indigenous peoples of the Marshall Islands, and to the billions of humans who faced annihilation during the worst moments of the Cold War. "When you see something that is technically sweet, you go ahead and do it and you argue about what to do about it only after you have had your technical success. That is the way it was with the atomic bomb." NEWS FLASH: Push the button on Simnuke! Up for auction on eBay. This is attempt to raise the funds we need to complete this project.